Workforce training programs are supported by federal and state funding and in Massachusetts are located primarily in three key agencies: Labor and Workforce Development, Education, and Health and Human Services. MassBudget's new online tool, the Jobs & Workforce Budget, details the state's role in supporting workforce training. As shown in the graph below, state funding for workforce training has fallen over time, down 30 percent between FY 2001 and FY 2014. This reduction is driven largely by a $46 million cut to the Employment Services Program, which primarily funds employment and training services for recipients of temporary assistance (TAFDC). Declines in spending for workforce training follow roughly the same pattern as cuts made to programs like higher education, local aid, and public health. Since cutting taxes by over $3 billion between 1998 and 2002, our state has made deep cuts across the budget. This drop in revenues has meant that our state has been barely able to balance the budget even in good times. In times of economic crisis we are forced to make difficult decisions to cut programs and rely on reserves to fill some of the gaps. State spending on workforce training has not been immune to this trend. The Jobs & Workforce Budget is an online tool that provides information and analysis of the many programs in our state budget that support workforce development. This paper describes the tool and highlights key findings. The Overview provides the total picture of state spending on jobs and workforce training. The tool's homepage sets the broad context and details historic funding levels for these programs as a group. Individual program (or line item) descriptions provide full descriptions of the various state-supported programs in Massachusetts along with long-term funding histories and new funding proposals. Users can identify individual program descriptions either by navigating within category pages or by searching for keywords. Many other programs not detailed in this tool also support skill development and contribute to economic growth, but because they perform other functions in addition we do not include them in this online tool. The state's community college system is one useful example. Community colleges serve a range of functions, providing general education to students hoping to transition into four-year bachelor's programs as well as providing direct job training designed to meet the specific needs of regional labor markets. Ultimately most of their activities advance both these educational and workforce training goals. For detail on historic support for higher education in Massachusetts users can navigate through the Higher Education section of MassBudget's Budget Browser. The Jobs & Workforce Budget focuses on worker training programs funded through the state budget. It is important to note, however, that many of these programs also rely on other non-state funding sources. Specifically, the federal government plays a foundational role in funding programs like One Stop Career Centers and Adult Basic Education. Because federal dollars for programs like these do not flow through our state budget, they are not reflected in the funding detail we include here. In addition, some federally-funded programs, such as training supported by the federal Workforce Investment Act, are not included in the browser at all because funding flows by formula to the local or regional level. More information about these streams of direct, federal support is available through the National Skills Coalition. Further, many providers raise philanthropic funds to help support their workforce programs. Even local governments help support workforce training, such as through support for vocational high schools. Our state government funds a set of core workforce development supports for adult workers. Workforce development programs help job seekers identify opportunities, access training, connect to employers, and apply for jobs. These state programs also support incumbent workers (those currently working) in developing new skills to access career advancement opportunities and to help their employers become more competitive. Overall state funding for programs in this category has been cut by more than half—roughly 55 percent—since FY 2001. While funding has varied across the different programs in this category, the majority of this dramatic decrease is driven by cuts to the Employment Services Program, which primarily funds employment and training services for recipients of temporary assistance (TAFDC). This program was funded at $54 million in FY2001 (adjusted for inflation) and is now down to just $7.8 million in FY 2014. In addition, the Workforce Competitiveness Trust Fund, established in FY2006 to support sector-based training programs and partnerships with businesses, has received state contributions just twice—in FY2006 and FY2013. While most funding for these programs comes from general fund appropriations, funding for the Workforce Training Fund Program comes entirely from employer assessments that are connected to the state's unemployment insurance system. Employer contributions are deposited into a trust fund administered by the Executive Office of Labor and Workforce Development. Commonwealth Corporation, along with an advisory board, administers the programs supported by the fund. Any Massachusetts business that pays into the fund is eligible to apply for grants to train current and newly hired employees. Another program focused on employer needs is the Advanced Manufacturing Workforce Development Grants program. These workforce development grants are distributed by the Executive Office of Housing and Economic Development and are designed to support coordinated training programs between manufacturers and vocational schools or community colleges. State government in Massachusetts plays an important role supporting the full education pipeline from early education and care to K-12 education to public higher education. While all of these investments help develop the state's workforce over the long term, the Jobs & Workforce Budget focuses on those education programs that most directly perform workforce development functions. These programs help adults improve their basic skills, improve their English, assist with college transition and enrollment, and encourage college students to enter fast-growing sectors of the economy. For more detail see the Adult Basic Education program page. Also in the Jobs & Workforce Budget's education category are Adult College Transition Services, High Demand Scholarships, and the Science Technology & Engineering (STEM) Pipeline Fund. Massachusetts funds a number of programs that help disabled adults identify work opportunities, develop needed job skills, and make workplace modifications. State funding for these programs is down dramatically, by roughly 47 percent since FY 2001. The largest of these programs is Vocational Rehabilitation for the Disabled, funded at roughly $10 million per year, which helps workers with disabilities become more independent. Supports include skill evaluations and identification of job goals, development of assistive technologies, and education for employers about the Americans with Disabilities Act. It is important to note that other programs, such as Community Day and Work Programs for the Developmentally Disabled, also provide job supports for disabled adults, but because these line items include funding largely for other non-employment related supports, we do not include their funding towards the totals above. The Youth Development section provides an overview of programs designed to help young people get on pathways toward promising careers. Since the needs of young people range widely, most of these programs provide more than just direct job training or placement. Some combine job training with academic support for those who have not yet finished high school. Others combine job training with social services and violence prevention programs for young adults who have struggled to stay on a positive track. 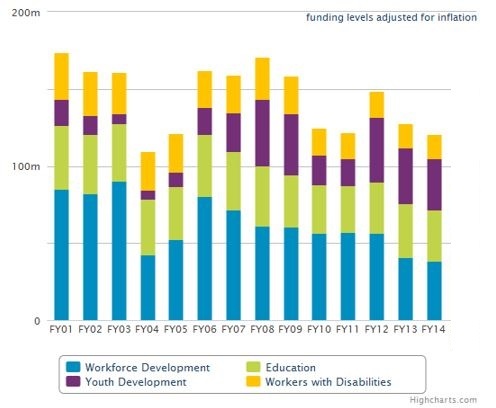 Youth Development is the one category within the Jobs & Workforce Budget that has received significantly increased state funding, more than doubling since FY 2001. Funding for YouthWorks, for instance, increased from less than one million dollars in FY 2001 to about $10 million in FY 2014. Within Youth Development, however, support for various other core line items has declined even as total funding has increased. In particular, funding for School-to-Career Connecting Activities, which helps in-school young adults connect to career-focused paid jobs and internships, has decreased from $6.8 million in FY01 to $2.8 million in FY14, meaning many thousands of young people have not been able to access these employment opportunities. Combined with some sharp declines in federal funding, the workforce development system in Massachusetts has experienced significant state funding cuts, even as demand for training and education programs increased during the Great Recession.3 While a small number of new programs have been created, and some programs, particularly for youth, have seen funding increases, the overall trend has been towards asking these programs to do more with less. A strong, well-financed workforce training system is becoming increasingly important both for expanding economic opportunity for our people and for developing a strong and dynamic economy. The Jobs & Workforce Budget is designed as a live resource for understanding and tracking state support for workforce training across the Commonwealth. Funding levels are displayed in the tool as legislative budget proposals are released and as final budgets are adopted. Further, descriptions are added as new programs are created and descriptions for existing programs will be updated as they change. 1For a discussion of income trends and wages see MassBudget's The State of Working Massachusetts.